We all know the numbers of the months. January is Number One! July is the 7th month, and December is the 12th. But some folks need to know which week it is, and Visio has no formatting option to show dates as indexed weeks. So we’re here to tell you how to do it! Everyone knows there’s 52 weeks in a year. Well, actually 52.179 weeks if you’re being persnickety and divide 365.25 by 7. But did you know that you can actually have 53 weeks in a year? You’ll notice that the 1st of January doesn’t fall on Monday all that often, and our Monday-starting weeks can spill into the next year. That’s how we can end up with 53 week-rows in a year’s calendar. The first and last weeks include days from the previous and next years, but there are still only 52 seven-day periods in a year. Since I primarily create software and web-sites, and don’t do much real work, I’m not exactly sure why people need to use numbered weeks. I they could be helpful for scheduling, since a work week always has five work-days, and you don’t have to be confounded by variable-length months. A quick search of the web reveals a few names for calendar weeks: Which term do you use? 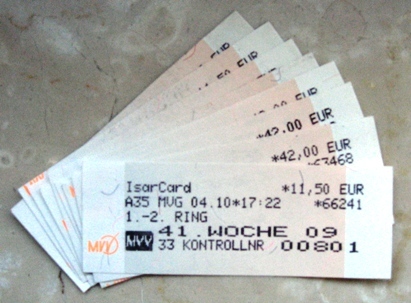 To translate: “41.Woche 09” means “the 41st week of 2009”! 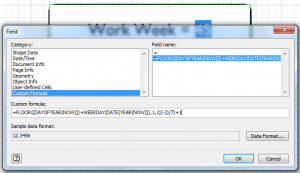 I should also mention that Jumpy asked the question in the Visio forum about how to do calculate calendar weeks, and he mentioned kalenderwoche, so that further supports my observation. Thanks for the article idea, Jumpy! While this works just fine, the NOW() bits in the formula update quite often, which may or may not be desirable. Every time you open your Visio document, this field will update. This makes it great for a title-block element in a template that you use often. But if you are illustrating date-related themes, you’ll likely want to tie the date to some sort of data stored in the shape, such as a Shape Data field. You add the field to the shape by selecting the shape, then choosing Data > Shape Data. 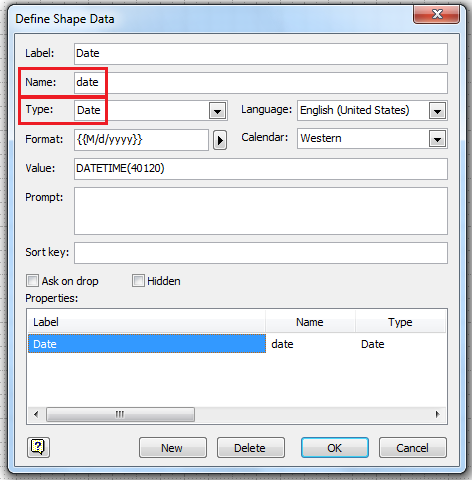 In the Define Shape Data dialog you can set the field type to “Date”. You can also set the Label and Name of the field. Users see the Label in the Shape Data window, and developers use the Name in the form: Prop.Name to create ShapeSheet formulas. 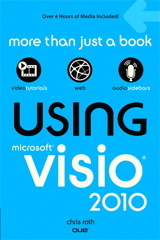 Note: you won’t see the Name field unless you have configured Visio to be in Developer Mode. In order to develop the big long formulas mentioned above, I initially created several calculation steps inside of User-cells. If you’re interested in how the formula works, and are curious about several ShapeSheet date-related formulas, you might find this section interesting. …calculates the week number, which is what we were after in the first place! Once I understood how to calculate the work week, I was able to consolidate all of these cells into one big, long formula. Easier to implement, but harder to understand. You can decide whether you want to use one long formula or several shorter ones. The calculations I did assume the week begins on Monday. If you want your calendar weeks to start on Sunday, it might be easier to experiment with the broken-down formulas, then consolidate once you’ve got it working properly. So now you’re an expert at calculating calendar weeks. You understand the theory and got 100 on the test. So why waste time doing it yourself when someone else already has? 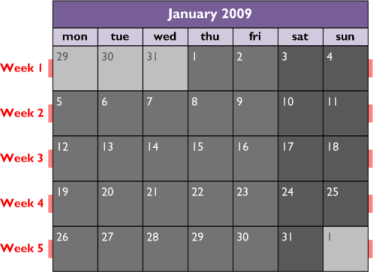 If you use calendar weeks for scheduling, you might be interested in the 2009 Work Week Calendar templates on offer from The Closet Entrepreneur. You can download PDF and Excel formats. 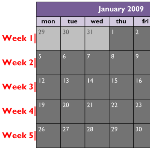 And if you want to quickly look up the work weeks in a particular month, this site will help. Or you could just make a smart shape that knows what week it is and use it as a tool to look up work weeks! Week numbering is discussed in the ISO 8601 standard. It is used extensively in manufacturing environments, where customer order/shipping cycles do tend to cluster around week boundries (for any process that takes more than 2 days to complete anyway) and where a scheduling/purchasing granularity of 1 day is too fine to be practically usable. Note that whether a week runs Monday-Sunday or Sunday-Saturday depends on the nation and entity using the numbering system, which means there are variations on the strict ISO 8601 standard. I was trying to make this work but every time I copied the code into the Custom Formula field I get an “Error in Formula” message. I am relatively new to Visio so it’s quite possible that I’m doing something wrong. Has anyone else had this problem or can someone point out what I might be doing wrong here? Do any of the formulas that aren’t working for you contain “User.” or “Prop.” cells that you haven’t yet created in the shape? I have managed to show the weeknumber on a simple shape. but how do you put it on a timeline? I do want the interim markers to show the week number.